UTM Brantford is comprised of a mix of players born in 2001 and 2000. To participate in the Rebelles 16U tournament, the team needed to backfill roster positions that were vacated by players unable to make the trip to the Rebelles Tournament over the Canada Day weekend. 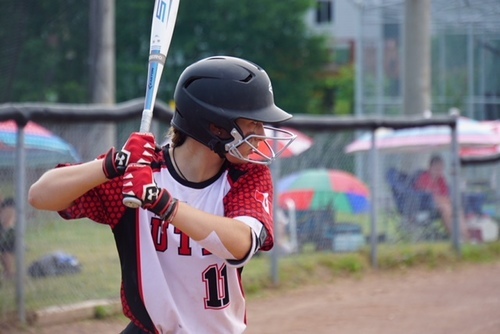 An opportunity was presented to teams attending, the chance to have a player join the team for the weekend who was on an exchange program in Quebec, and loved to play competitive softball. It was an opportunity UTM couldn't pass up, which led to the team having a chance to meet, learn and experience from this talented player from Austria --- Sophie deRouin. Sophie on the field contributed making some stellar plays defensively, and offensively she was a leader over the weekend collecting 8 hits over the teams 6 games. Perhaps her strongest asset on the field of play was her baserunning, she electrified the bench on numerous ocasions by agressively taking an extra base on many ocasions and forcing the opponents to make a tough throw and in almost every circumstance the throw wasn't enough to get her. However even better than Sophie's on field contributions were the friendships made and the last memories the UTM Brantford team will have with this amazing young woman. Sophie will be heading back to Austria soon to continue her schooling, her softball (Austrian National team) and we will all look forward to staying in touch with her in the weeks and months to come.